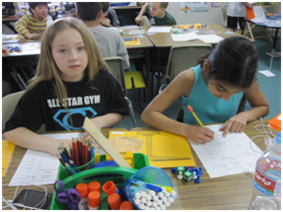 Hands on Equations is an amazing program that gives children a hands on approach to algebra. Teachers in 4th and 5th grade at Town Center have truly capitalized on the use of technology and the GT Co- teach model by implementing these lessons via IPods. This process began last year as all 26 lessons were videotaped and synced to the IPods. The 4-5 grade teachers were enthusiastic in implementing this program with the help of the GT specialist. Because of Town Center’s classroom looping system, a fourth grade teacher can begin these lessons in 4th grade and track the student’s progress through fifth grade. 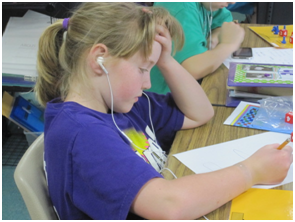 Recent CBE scores in 5th grade showed algebra as the highest math strand for 5th grade. A student can work at his or her own pace. The benefit of listening to these on the IPOD is a child can review the lesson as much as needed. 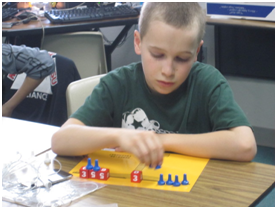 Taylor Dubey, a fifth grader, says, “Hands on Equations is challenging and a lot easier way to learn algebra.” This is the general consensus of students at TCE.